You'll learn how to cache data in swift by developing a local cache based on core data for the downloaded data. You'll see through an example how to define a custom Table View for iOS using Swift, how to load the json data that define the images urls and descriptions, how to load images from url and how to store image in core data. You'll see how to read the stored cached data from core data entity and display the images without dowloading them again. Create a new iOS single view applicaton project. Be sure to check that the use core data functionality is on. Let's now define the layout. Open the Main.storyboard (you can turn the use size classes functionality off) and put a UITableView component. Put inside the UITableView component the UITableViewCell. With the previously added cell selected, set the reuse identifier (attribute inspector menu) to cell. Open now the assistant editor and link the table view component to the ViewController class. Call the variable tableview. For the Json data I've prepared for you a simple data structure. You can find it here. It is a simple array of objects. If you want, you can use this easy tool to explore the structure in a readable format. 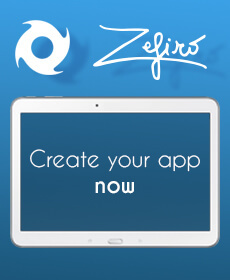 Open now the ViewController and let's define the required variables. The TableData array will contain the json extracted list. Moreover it has also a UIImage variable (called image) that is initialized to nil. This variable will contain the image data, when available. This varialbe is used to define a local cache that will store for a given session the image data. In this way, when you scroll down the table the cell is reused for another image. As soon as you scroll up again the image is in the cache and will not be downloaded again. Let's define now the Table view behaviour. 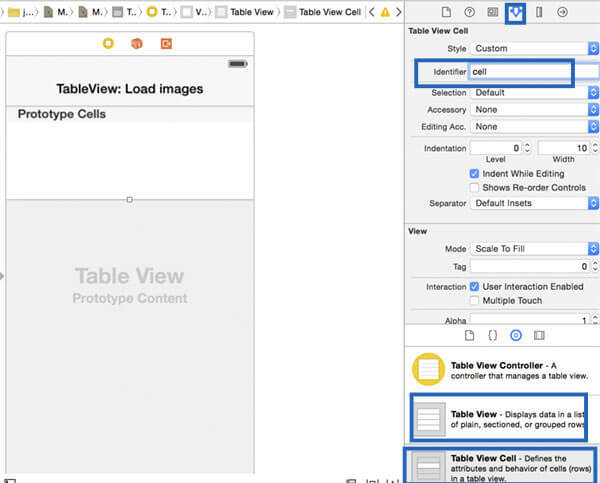 Be also sure that the ViewController class implements also the UITableViewDataSource and the UITableViewDelegate. At this point we have the table view ready to display the data in a proper way, but we need now the data. Let's now define the Core data entity that will store the images in a permanent way. It means that if you close the app and you open it again, the data is still here. In this way the core data will be used for caching the download images. Open the xcdatamodeld and insert a new entity. Call it Images and add two attributes: image - Binary Data and index - type integer 16. Turn now back to the ViewController class. We'll define the functions that download the JSON data in an asynchronous way, extract the JSON data, fill the array with the data and refresh the table. After the JSON data are extracted, the read function is called. 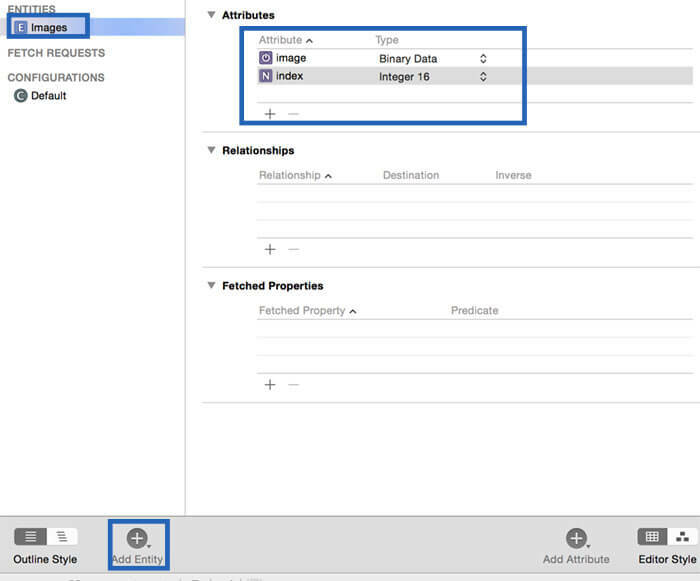 This function will be implemented in the next step and will read from the Core Data entity the stored data and will fill the TableData array with the cached images data. Let's now define the function that will download the image from url, update the TableData local cache (for that session), update the Core data (for the permanent cache) and finally update the UITableViewCell image. var imgURL: NSURL = NSURL(string: urlString)! Let's now define the functions that will read and store the data in core data. Be sure to import the CoreData library. 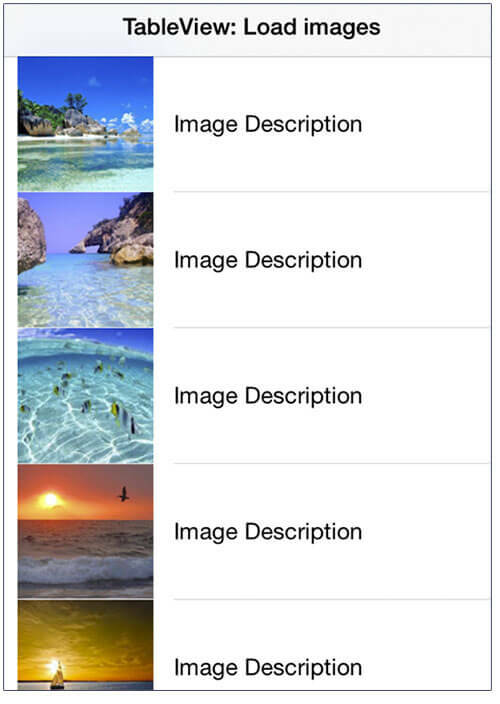 The UIImageJPEGRepresentation function let us convert the jpg image to a data format that can be stored and cached in core data. The read function let you read all the image you've stored in core data. The save function will store image in core data. If you enjoyed this tutorial, share it. You can fine more Swift tutorial here. For any question, be free to write a comment below. Hi Great tutotial. I am struggling with the conversion to Swift3 / iOS10 Can you please update the tutorial? Thanks! Hi Thanks for the great tutorial. I'm wondering where do you set the exact position of the image and the label? Hi, thank you for your comment. In this tutorial I've applied core data only for the images. This app requires to be online to download the external json data structure, and only then can display the images that are inside core data - this will reduce the required bandwith to avoid downloading every time the images. In order to allow this app to working also offline, you may to store inside core data also the json data. You can Have somthing link the url and the data, Every time you have to download some data, check the offline version inside core data and directly display it. I misunderstood, I download the tutorial, it does not work in offline mode, my question is, is that this tutorial works in offline mode ? No, the app-example requires to be online to download the json data. Only the images binary is cached in core data. Hi, thank you for your comment. You can change the name of the images that will be downloaded as you want. The image.jpg image is just a blue placeholder that is displayed when the image has not been downloaded yet. Everything else is defined by the json data and is downloaded with the load_image function. Hi, do you mean if it is possible to add the pull to refresh functionality to refresh the data? Thank you so much for this! This is so simple and easy to follow! This will result in an ever increasing CoreData, a proper cache design pattern should also take care of clearing the data... and loading images from CoreData, not using the network everytime. Hi, thank you for your comment. In this example I've covered only the part of caching the images and not of removing them when unused. Moreover the images (not the json data) are loaded from coredata as you can seen from the current example without using the network. Shouldn't the images still load when there is no network connection? They don't. Great tutorial, but seems that if they not loading from core data without network connection, what is the point? Hi, thank you for your comment. This example store only the images in cache, not the data with the images. Images can waste a lot of bandwith, while json data are few kb. So if you turn off the connection, no data for the table will be downloaded. Be free to edit this example to extend it also for the json data. Hi Alex, be sure to write it exactly like that: http://www.kaleidosblog.com/tutorial/NSAppTransportSecurity.txt If you still can't access to the http links, be free to send me your info.plist to let me check it out.